How long should I stretch for? What is the best way to stretch? Although there are many different stretching techniques, the research is not very conclusive as to which is the best stretching technique. For an older adult or anyone new to exercise we always suggest that at the end of the exercise session you do some gentle static stretching focusing on the major muscle groups in the body. This is a safe way to stretch and will produce increases in flexibility and range of motion if done consistently. For each stretch you choose, stretch to the point where you feel a stretch or slight pull, but still feel comfortable holding. Hold at this point for about 20 to 30 seconds. Don’t forget to breathe! 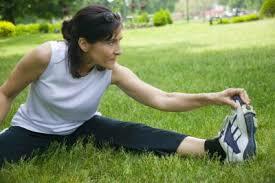 Take nice slow and full breaths while stretching. Remember, you want to make sure you are well warmed up before stretching.